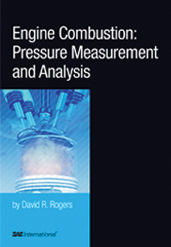 David R. Rogers - AVL UK, Ltd.
Engine combustion pressure analysis is a fundamental measurement technique applied universally in the research and development of reciprocating combustion engines. As combustion pressure measurement systems have become almost standard equipment in engine test environments, technicians and engineers need to have a solid understanding of this technique and the associated equipment. This book provides practical information on measuring, analyzing, and qualifying combustion data, as well as details on hardware and software requirements and system components. Describing the principles of a successful combustion measurement process, the book will enable technicians and engineers to efficiently generate the required data to complete their development tasks. Readers will learn: The features and functions of equipment Best practices for successful measurements How to recognize and diagnose problems Engine Combustion: Pressure Measurement and Analysisis a comprehensive handbook for technicians and engineers involved in engine testing and development, and a valuable reference for scientists and students who wish to understand combustion measurement processes and techniques. If you do not have access to SAE MOBILUS via username/password or institutional access, you can still purchase the Book, Engine Combustion: Pressure Measurement and Analysis.